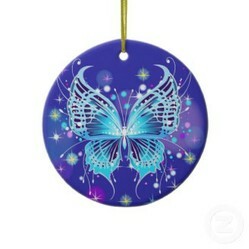 Beautiful butterfly Christmas ornaments for your Christmas tree this holiday season. Butterflies are a favorite of many people because of their delicacy and beauty. But they're often overlooked as Christmas themes even though they're a good choice. When decorating for Christmas it makes the season more special if you use symbols that have personal meaning. So if you love the look of butterflies of if they have special meaning to you they're perfect for decorating. There's a lot of symbolism connected to butterflies. One of these symbols links butterflies to 'celebration'. This makes them a lovely decorating theme for a major holiday like Christmas too. If you'd like to have butterfly ornaments on your Christmas tree you might need to look around a bit. They're not easy to find. But I found some lovely ones to feature here that I really like. Did you know that love is something else butterflies are symbolic for? This means heart shaped butterfly ornaments are a nice choice if you'd like to to have a symbol of love on your tree. Pink isn't a classic Christmas color but it is one that symbolizes love. So it strengthens the connection to love that this butterfly ornament has. The "bling" on this ornament gives it a celebratory feel but the "bling" won't actually sparkle. This is because the design has been printed onto the ornament. But it's still a lovely butterfly ornament symbolizing love for your Christmas tree. 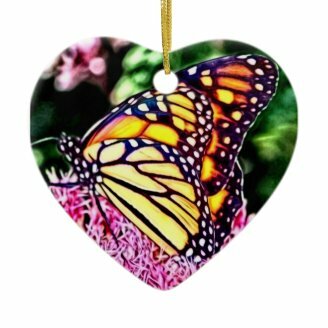 This Christmas butterfly ornament is the most popular of all the best selling ornaments with real butterfly photos. . 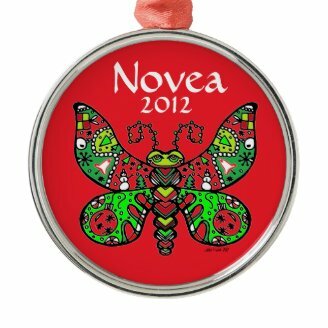 The Monarch Butterfly on this ornament is bright and festive looking for Christmas. The colors aren't classic for Christmas because Monarch Butterflies aren't red and green. The natural green background in this ornament does link it in with classic Christmas colors though. The orange of the butterfly isn't too different from the usual red either. This is because both are warm colors. So this is another nice choice for Christmas. This ornament isn't a traditional design at all. But it does have a lovely brightness and warmth. So it's easy to see where it got it's name of "Sunflower Radiance". This Christmas butterfly ornament is a nice choice if you want a flower-butterfly theme rather than just a butterfly one. Sunflowers are symbolic of happiness so they're a good match to the mood of the Christmas season. They're also a good way to add a feeling of warmth if your Christmas happens in a cold climate. So it's easy to see why this butterfly ornament would be a best seller. 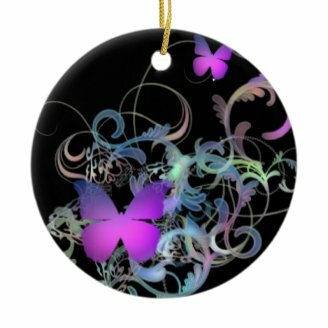 This black and purple butterfly ornament is very eye catching. This is because of the colors used and the swirling design. I think it would look fabulous on any tree, but it would look especially striking on a modern looking tree that's silver, white, purple, blue or pink. Like the colored Christmas trees this ornament is very modern and sleek looking. 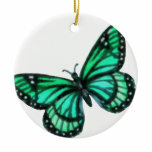 This butterfly ornament would also look good on a traditional green Christmas tree of course. This is because an ornament like this lets you modernize a traditional looking tree. These ornaments are created for the 2012 Christmas season and are my picks for the next top sellers. This is another ornament that uses a heart shaped design to highlight the butterfly's symbolic connection to love. The colors in this real photo of a Monarch Butterfly also add a festive feel that's modern but not too far from the classic look. This is because of the deep green coloring in the ornament. But I think the pink color adds the festive feel. This is because it brightens the orange-black and green coloring. 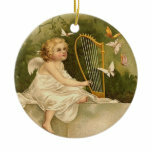 This is the most traditional looking of all the butterfly ornaments I've featured in this article. The colors the designer has used to create this ornament fits perfectly with the classic colors of the season. So it's the best pick if you want to keep to the traditional colors of Christmas - red, white and green. This butterfly design has a bit of a modern looking flair to it though. The shape and design of the wings have a modern edge. This gives the ornament a nice balance between the new and the classic and creates an interesting ornament for your Christmas tree. 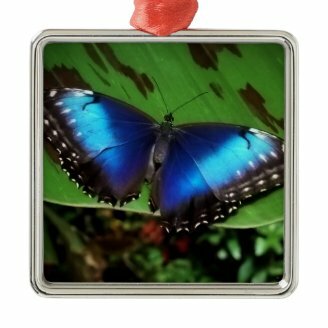 I absolutely love these Blue Morpho Butterflies so I was a little biased when I picked this Christmas ornament for the predicted best sellers for 2012 list. The colors of these butterflies are amazing. The richness and differing shades of blues. The black border on the butterfly's wings which highlight the deep blues even more. This is the Christmas butterfly ornament I will be buying. Despite my focus being on the butterfly itself the green leaf background and red ribbon definitely add to the Christmas feel of this ornament. 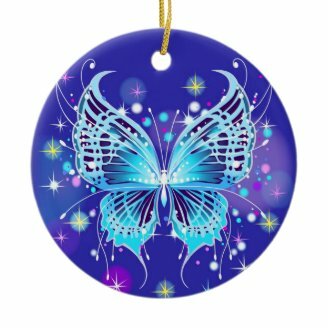 This butterfly Christmas ornament is another nice choice if you want something blue. It's very different to the Morpho Butterfly ornament which is created from a photo. Instead this ornament is a graphic design that's very modern looking. This butterfly design looks like it could have flown out of a fairy or magical book. So it's name is certainly well suited. The modern feel comes from an almost grunge design. The different shades of blue and complementary colors make this a really beautiful design. So I think this will become one of the best selling butterfly Christmas ornaments for 2012.